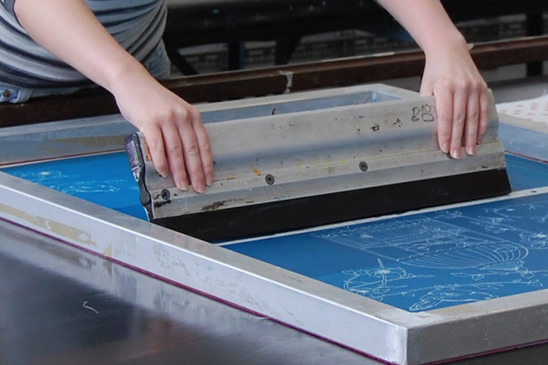 One of the oldest and most adaptable forms of printing processes available today is Screen Printing. First recognised in early China, silk screen printing is a widely recognised form of print, made famous throughout the years by artists such as Andy Warhol and his famous depictions of Marilyn Monroe. In this day and age, screen printing can be adapted to work for almost any material. This process involves a bespoke silk screen, graded in tiers for density of mesh, imprinted with an impenetrable stencil. The screen is coated with the ink and a 'squeegee' is used to push the ink through the mesh, depositing it onto the product through the stencil. The finer the silk mesh, the more detailed and crisp the finished print will be. As screen printers we can print on all promotional plastics, glassware and metals; printing everything from stainless steel drinks bottles and large quantity cosmetics bottles to full page corporate notebooks and automotive parts. One of the two key areas of screen printing we focus on is Flat Bed Screen Printing, used for large flat areas with no obstructions. We create bespoke sized 'Jigs' and screens to accommodate a huge variety of print sizes, tailoring each mesh density and ink to the surface of the product. We have 35 years experience working with Screen Printing and our specialist Screen Printing team have over 50 years combined experience printing all manner of products! This type of printing is especially suited to large deposits of inks, where traditional pad printing would prove difficult. The second type of screen printing we focus on is Rotary Screen Printing. This process, whilst similar to Flat Bed Screen Printing by definition, offers more flexibility to the area we can print. Rotary Screen Printing turns tricky to print circular products into an easy, clean process. It's especially suited to drinks bottles, cosmetics bottles, mugs and stemmed glassware where a full coverage, 360 degree print is required. As rotary screen printers, we offer full consultations and unlimited advice on all enquiries and orders. We strive for excellence every day.